Jessica Barboza – Hot Pinoy! The 9th edition of Miss Earth beauty pageant was concluded last night of November 22nd at the Boracay Ecovillage Resort and Convention Center, Aklan, Philippines with Larissa Ramos of Brazil taking the title of Miss Earth 2009. Out of the 80 delegates from various countries and territories, Larissa Ramos emerged to be the winner and succeeded the crown of Miss Earth 2008 Karla Henry of the Philippines. 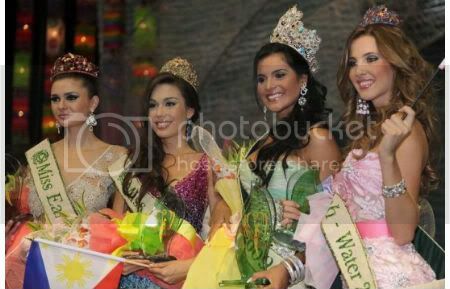 Sandra Seifert of the Philippines manage to take away the 1st Runner-up title Miss Air 2009, while Jessica Barboza of Venezuela and Alejandra Echevarria of Spain won Miss Water and Miss Fire, respectively.